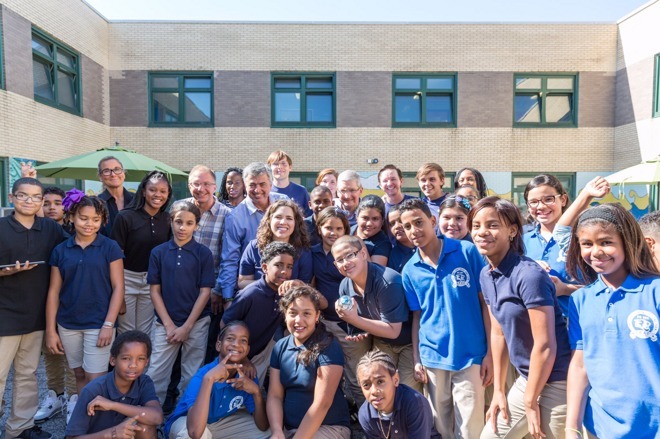 Two years after Apple's commitment to the U.S. government ConnectED program, Apple CEO Tim Cook visited Harlem's Pedro Albizu Campos School to examine success of the program, and to take a look at overall student progress because of the donated technology. "These kids are born in a digital world, and if they come to school and ... have an analog environment, it's not conducive to learning. It's not conducive to creativity," Cook said to ABC's Robin Roberts during the visit. "We're bringing digital to the schools here, and we're focused on under served schools." ConnectED was launched in 2013 and is an intended to encourage tech companies to assist in upgrading technology found in bolster underserved schools. President Barack Obama cited Apple's $100 million commitment to the program in the 2014 State of the Union address. In August, Apple confirmed that its contributions to the ConnectED program has helped 114 schools in 29 states across the country with tech support, 4,434 hours of assistance from Professional Learning Specialists, and wireless networking upgrades that included 189 miles of internet cable infrastructure. In the schools Apple assists, it donates an iPad to every student and teacher, and gives a Mac to teachers as well. Classrooms are outfitted with networking equipment, and an Apple TV. "It's going fabulous," Cook said, while noting an increase in students' math scores attributed to the program. "We feel really good." The visit was in conjunction with an interview with "Good Morning America" broadcast on Wednesday. In that segment of the interview, Cook discussed the Apple's view of the future of augmented reality and virtual reality, design decisions behind not including a headphone jack on the iPhone 7 family, as well as addressing some social media comments about the company's AirPods.